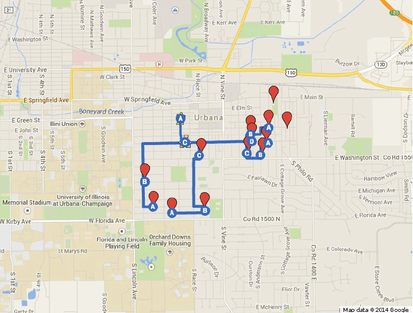 From coast to coast, and in Urbana, Illinois, schools and communities are implementing Walking School Bus Programs. These are a lot like regular school buses, they have a "driver" and pick and drop kids off at home. However they use NO FUEL, have no wheels, and are WAY more fun! Just ask the kids who participate. Why a Walking School Bus? Currently, this program is only offered at Leal Elementary/Escuela Leal. Fill out the required information and you will be contacted with more information. Are you interested in volunteering for the Walking School Bus? Would you like to start your day with fresh air, fun, and exercise? Then join our Walking School Bus Program. We are looking for volunteers to serve as leaders to help us walk children from their homes to the school. Fill out the information below and we will contact you. Walking School Bus routes at Leal Elementary from Fall 2014.